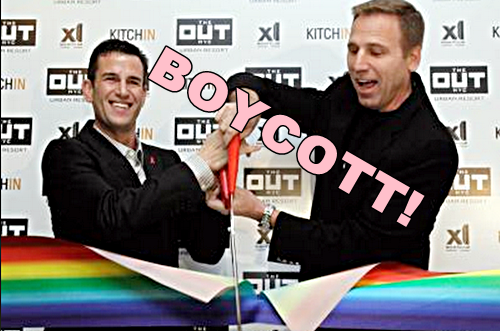 Multi-millionaire OUT NYC Hotelier Ian Reisner Who Hosted Ted Cruz: "Gays Are Cheap, Gays Are Entitled"
“You know, it’s so ironic — I wanted to build kind of a community center in the gateway to Hell’s Kitchen, which in 2008–2009 was already a gay place and now it’s even gayer. Very close to Broadway. We decided there’d be so many different ways to give back to the community. We show gay artists there. For gay performers, we have let this cabaret club go on for three and a half years. And you don’t make money when you let drag queens in on Tuesday night and 30 people drink at $10 a drink and you have to pay five people to watch over the place. You don’t make money … My only point is, this has not been a profitable venture. Gays are cheap. They’re frugal; gays are frugal. Let me retract that … gays are entitled … Do you know how challenging it is to make a penny off a gay person? I’m gay, I don’t pay cover. I’m gay, where’s my comp drink? [Everyone laughs.] No, I’m being serious! The Out NYC has not shown a profit yet.” – Ian Reisner, in a New York Magazine joint interview with Mati Weiderpass. Oh keep digging, by all means! Yesterday on the Facebook page of the NYC Council’s LGBT Caucus, they call for a continued boycott of OUT NYC, and all Reisner and Weiderpass properties. It just underscores what trans people have known for decades: Once the rich gays get what they want (read: marriage), their sense of community responsibility disappears. They start supporting Republicans (because that’s what they perceive as best for their own wallets) and the rest of us are left to fend for ourselves. The only reason this is an issue at all is because they timed it badly, right at the beginning of a presidential campaign where income inequality is a big issue in the media. If this had happened two years ago, no one would have noticed or cared. That disconnect seems to happen with every group that is under represented, equal rights, women’s rights, LGBTQ rights. Reisner has certainly put his foot in his mouth big time and since his avowed intention was “to build kind of a community center in the gateway to Hell’s Kitchen, which in 2008–2009 was already a gay place and now it’s even gayer” trashing his main customer base is little short of commercial suicide. Gays are cheap? Honey, we buy the best stuff we can find from anywhere whether it be the most expensive chic place to the Goodwill, we will make it fabulous. In what world has it become so accepted to be gay that you can just walk into a bar and expect a free drink for being gay? Please give me the address so I can go get a drink! Does this fool not realize that Republican Outsourcing has impacted Gays just as much as it has impacted the African American community? Where I used to work, most gays and blacks seemed to work together under the control of the “free market” corporations which quickly liquidated us all when they found they could outsource their jobs to be done by wage slaves in india for $1 an hour with no labor laws AND get a tax break in the US for doing so. That’s Bush’s baby. That’s what Republicans have defended against THREE attempts by Democrats when they had power to reverse outsourcing. Until that happens, we will all suffer by competing with wage slaves in other countries. They will force all of us to “live with less” while they hoover up all the savings NOT paying an American Wage to American Workers and instead, parasitically draining the life force out of foreign workers. Entitled? I think he was talking about rich folk LIKE HIM. Gays are not cheap. We don’t feel entitled either or act like it. We try to live and experience as much as possible, with friends and family. Our interest are not just bars, other things include, travel, art, music, fashion, charities, giving back to the cummunity, and fulfilling our own goals and dreams. Some us do better then others, but those who don’t, don’t expect comped drinks, by all means. We have dated and be friended folks who have bigger accounts, even then, we are independent and sufficient. Point is, we’re wise about how to spend, for our own sake. We are not home bodies, we like to live, explore and enjoy all sorts of possible experiences. That’s what life is about, you have to respect, love and value people, not shame and hate. It takes the an open heart and mind to understand that. Hope this message reaches those vial and venomous people. ROFLMAO…this said by a guy wearing a 2000.00 watch and 700.00 coat..SERIOUSLY doesn’t this guy realize the GAY community has a long memory. Doesn’t the idiot read ANY of the market research pertaining to GAY,LESBIAN,Transgender community? We have the highest levels of disposable capitol.Why most luxury product manufacturers target advertising to the LGBT communities.Those dollars are discriminating.Just because you have a LGBT business in a higher concentration neighborhood does not ensure success. If what you are offering is tired and lame and you do’t spend dollars to promote it. It will not be successful. I know this first hand from running a GAY bar in Boston. the LGBT community does not act “entitled’.but a business owner making comments like Mr Reisner made could be seen that way. Personally I could care less who he entertains privately in his home. He can host a party for Attila the Hun. If he is foolish enough to host Ted Cruz, the man that believe the army is going to over throw the government in a coupe,in TEXAS. Mr Cruz has been known to cultivate the intelligent challenged after all.